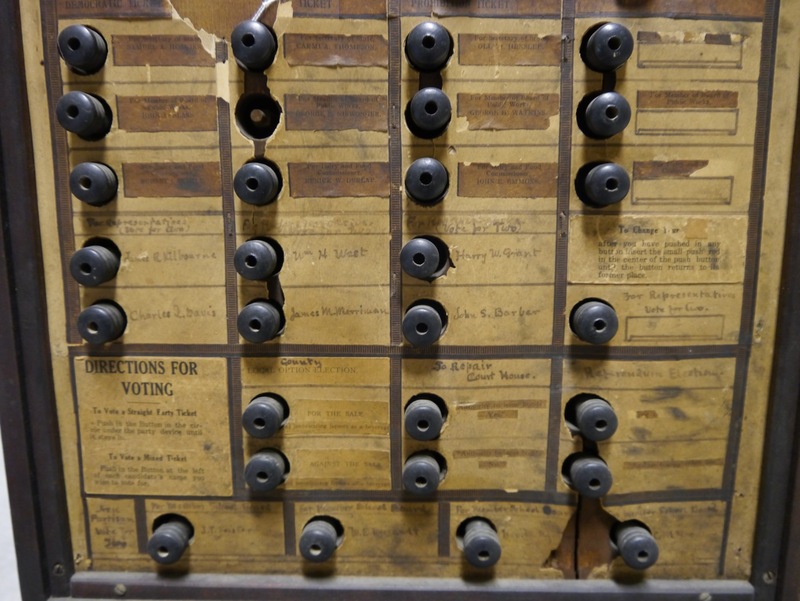 Judge Hiram B. Swartz’s 1906 Voting Machine. It seems appropriate to spotlight a Wooster inventor’s Voting Machine as the featured From The Collection artifact in November of 2016. These mechanical devices were used to define ballots and to cast and count votes during an election. This voting machine was designed and built by Judge Hiram B. Swartz during his retirement years. It was said he lived two lives: the first half of his life he devoted to practicing the law for 67 years. He was president of the Wayne County Bar Association, served four years as the Mayor of Wooster (1877-1881), and served as the Probate Judge of Wayne County for two terms in the 1890s. At around the age of 65 he started to work on his idea for a voting machine. He spent the remaining 30 years of his life designing, building, and improving his voting machine. He died at the age of 92 in 1939. 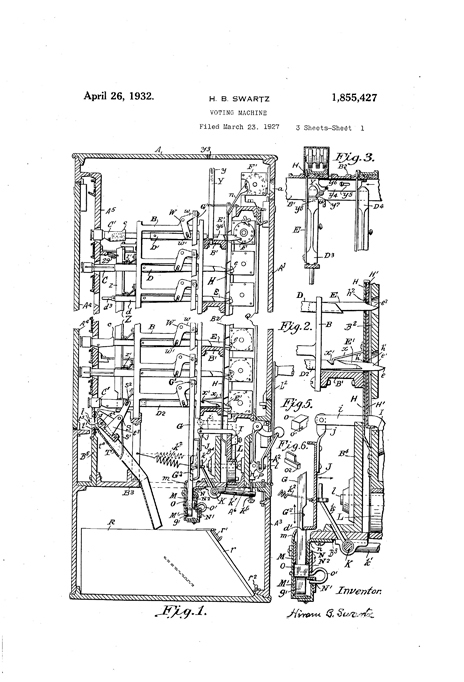 He applied for a patent on his voting machine in 1927 and it was granted in 1932. 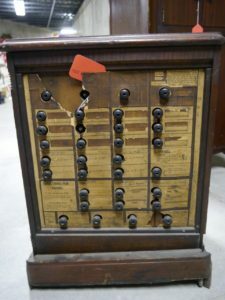 However, the one now in the Society’s collection is a much earlier model, dating to around 1906 from the names listed on the cardboard ballot on the front of the machine. The machine was reported to be an outstanding, intricate piece mechanism, that met all the legal requirements to safeguard the secrecy of the ballot. However, during the time in which Swartz invented his voting machine, an earlier decision of the supreme court of Ohio said that voting machines were held to be contrary to the requirement of a written ballot, contained in the state constitution. 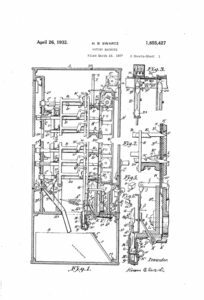 Eventually, the Ohio court reversed its decision, and in 1929 legislation permitted the use of voting machines as a part of the election code passed at that time. However, the machines were still not widely used based on a number of objections. Principally people simply did not like a change in the way they were used to voting: dropping their written ballot in a box. Furthermore, a voting machine required that they stand in line to use it. Additionally, the extra costs associated with purchasing, installing, and operating voting machines prohibited some communities from adopting them. The 1906 ballot designed along party lines: Democratic ticket, Republican ticket, and Prohibition ticket. The main argument against voting machines was that it is a machine, and as such is apt to get out of order at any time without warning and/or it might be manipulated for voter fraud. The voter records their vote and goes their way, no one knows where, and they leave no record of their action except that contained in the inner mechanism of the machine. When, later in the day, the machine is found to be out of order, it is impossible to round up all the voters a second time, and so the entire day’s votes are lost. The second, and perhaps the most serious objection, was that the machines were constructed upon an incorrect principle. They were all built with the idea of encouraging “straight voting” along party lines. You’ll notice on Swartz’s voting machine that all the candidates are aligned in a straight up and down line under each party’s ticket: Democrat, Republican, and Prohibition. The directions to vote state, “To Vote a Straight Ticket Push in the button under the party device until it stays in. To Vote a Mixed Ticket Push in the Button at the left of each candidate’s name you wish to vote for.” Encouraging a voter to push one button and vote for a party ticket and not have to push a bunch of buttons to actually choose between the individual candidates running. Essentially, getting the voter to vote for a political party, rather than a particular candidate. Furthermore, the early voting machines were different from other machines of the time in that its mistakes could not be corrected. 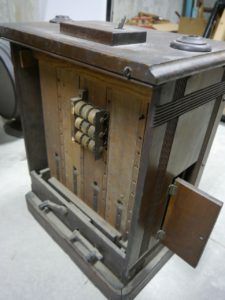 The work of the adding machine, the typewriter, and the linotype could be redone in cases where errors were discovered, but no such rectifying of mistakes was possible with the voting machine. The mechanism in the back of Swartz voting machine. Judge Swartz’s voting machine was an outstanding device for its time but he never gained business success in selling the machine to boards of elections. 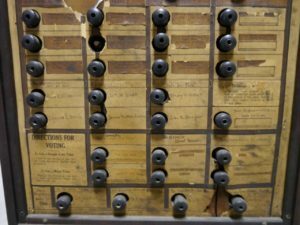 Voting machines have a long history of skepticism and continue to be controversial to this day. As mechanical voting machines give way to electronic voting machines, the same types of objections and concerns surrounding the early mechanical voting machines still exist with the 2016 electronic voting machines.